Food trucks in Los Angeles County will soon be required to post letter grades from public health officials evaluating their food-handling practices, supervisors said Tuesday. All five county supervisors voted for the new ordinance, which received preliminary approval Tuesday but must be ratified in another vote next week. The ordinance would go into effect 30 days after the final vote in unincorporated areas of the county; local city councils must ratify the new grading plan for it to be effective within city limits. Are the ABC letter grades necessary? Taco trucks are already regulated by the city. They must park in commissaries overnight. Their food must be prepared fresh daily inside their trucks. So it remains to be seen how this regulation is going to be any different other than letting the public know what letter grade a particular truck has received. 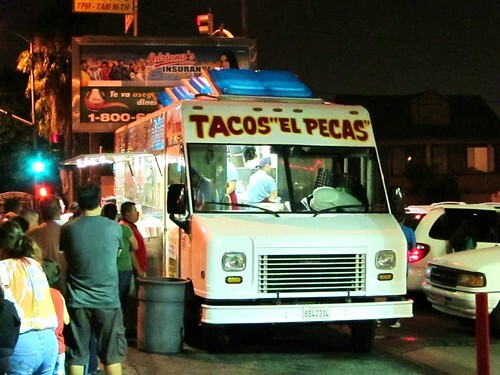 Or will taco trucks be required to give the city their location for random inspections? If that’s the case then us Angelinos can say goodbye to the salsa bar setups that many taco trucks offer their customers.